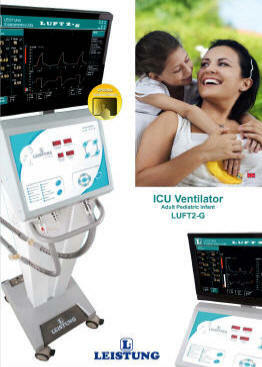 Developed to be one of the most complete lung ventilators in the market, LUFT2-g shows a friendly graphic interface with great ease of operation, allowing fast and safe adjustments of each parameter, so offering to the professional a pleasing work and permitting to give more attention to patient. LUFT2-g has all ventilation modes necessary to attend adult, pediatric and neonatal patients, plus an advanced respiratory mechanics menu for correct diagnosis, able to be used in the most rigorous and complex therapies, effectively and with reliability. of the equipment and assuring sensitivity values that avoid self-cycling, allowing a better progress of the patient without interferences. Warning messages are very easy to understand which turns possible to take decisions respecting the alarms situation and critical parameters variation. The final result is an ICU medical ventilator with a friendly interface, where its handling is very easy and intuitive, at the same time its configuration is simple and affective, so LUFT2-g practicability and operator competence can walk together, so that the maximum of LUFT2-g can be obtained: perfect and natural mechanical ventilation, delivering comfort and safety for adults and neonates. The lung ventilator for Intensive Care Units LUFT3 integrates a 17″ touchscreen and control by microprocessor offering a full range of ventilation modes and allowing the monitoring of adult, pediatric and neonatal patients. Easy Firmware upgrading without opening the ventilator. Gas measurements with BTPS corrections. Programmable nebulization time with automatic inspiration flow compression. 100% Oxygen up to 20 min. with alarms silence for 30 sec. sutdown the equipment and maintaining the historical log of the patient. Up to 5 selectable graphics simultaneous. Automatic Opening of the Pressure Regulator Valves.